Hello my friends! I know it has been a while since I last updated this blog. My apologies! My family and I finally got settled into our new home here in Hermiston, Oregon. we are truly grateful and thankful to be more fully established. Now that I have my sewing room back, I have plans to do more sewing projects this year. During the month of July, I made two garments. I was hoping to make more, but I was too busy unpacking boxes and organizing the house. But, I did manage to make a blouse and a skirt! You can watch my sewing vlog on my YouTube channel for more details on these two makes here. OK, let’s get started with the pattern review. The first sewing make for July was this beautiful 1950’s vintage blouse. I used the Simplicity 1278 pattern and I made view C.
I love this pattern! However, I did run into a few issues with the pleats toward the end of the project. I think I accidentally sewed over one of my pleats; therefore, the end result did not look as the image portrayed on the pattern’s envelope. I didn’t want to seam rip the area where I made a mistake because the fabric I used is a very thin and fragile rayon. So, I kept the stitch in place and instead, I made a female tie and bow. I sewed the tie to the garment where I accidentally sewed over the pleat. I hope that make sense. I chose this beautiful floral rayon fabric. I am in love with this fabric. I have about 1 yard of this fabric left. I can’t wait to use it again. Regarding the instructions for this pattern, I was extremely amazed at how clear and concise the instructions were. I had no issues with the instructions. However, I was a bit annoyed at the fact that certain cutting information was omitted. Let me explain! You know how on almost every pattern you use from one of the big four pattern companies there are details on the tissue paper indicating how many pieces you need to cut for that specific pattern piece? Well, someone forgot to include how many front and back bands you would need to cut for the project. This would not have been an issue if the band was to be used as facing. Turns out, you need to cut 2 front band pieces on a fold, and 4 back band pieces. One set is used for the collar and the other set is to be used for your facing. This information is not found on the pattern pieces. Luckily, I was able to see the manufacture’s “*note” on the instructions. Unfortunately, I waisted about an hour of my time look for said note. So, if you plan to make this pattern, keep that in mind! Other than this slight hiccup, I had no issues with this pattern. I did do a slight alteration to the pattern. 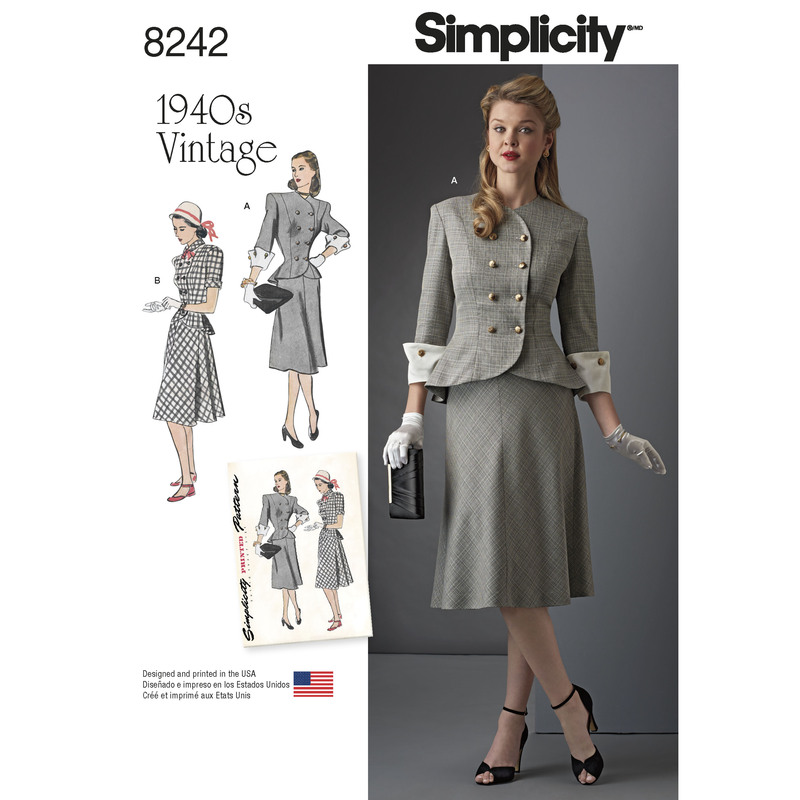 The pattern calls for 2 1/2′ buttons and a 14′ invisible zipper. The buttons are supposed to go in the back of the garment on the neck because there is a slight opening on the back of the garment. The zipper is supposed to be placed under the left arm (side zipper). I hate side zippers though. So, I decided to omit the buttons and side zip, and put a zipper down the center back of the garment. And, I added the tie for style and convenience, as I mentioned previously. Another one of my favorite makes this year is this skirt I made with simplicity pattern 8242. It is a 1940’s vintage pattern with two variations. It is a jacket and skirt suit. I didn’t make the jacket, but I am sure planning on making this entire pattern before the year end. The skirt was very easy and simple to make. The skirt pattern has four panels, so you are sewing two front skirt pieces together. Then you would sew the side skirt to the back skirt, you add your zipper and you are done! That easy and simple. I did do a minor alteration to this pattern as well. The zipper is supposed to be placed on the side of the garment. I put my zipper going down the center back. But that’s the only alteration I did. I chose this cute soft blue crepe back satin material for this project, and I used the satin side of the fabric for the inner part of the garment and the crepe side of the fabric for the out side of the garment. The picture here does not do the outfit justice. I will try to take more pictures later and re-post them later this year when I do a recap of all the garments I’ve made in 2018. Well that’s it for this post. Thank you so much for reading the blog and supporting me. Please head over to my YouTube channel and check out the video that I referenced in this post above. And if you like YouTube please subscribe to the channel! I will chat with you all soon! Until the next sewing make… stay creative! Posted on August 3, 2018 August 16, 2018 by TeaPosted in 1940s Vintage Styles, 1950s Vintage Styles, Make Nine 2018, UncategorizedTagged 1940sfashion, 1950sfashion, diyfashion, dressmaker, dressmaking, fabric, fabricaddict, fashionsewing, handmade, instasew, isew, makersgonnamake, retro, seamstress, sewing, sewingblog, sewsewsew, vintage, vintageclothing, vintagefashion, vintagepledge, vintagesewing, vintagestyle. That was my initial reaction! I wanted to cry! But I hate being defeated by patterns! 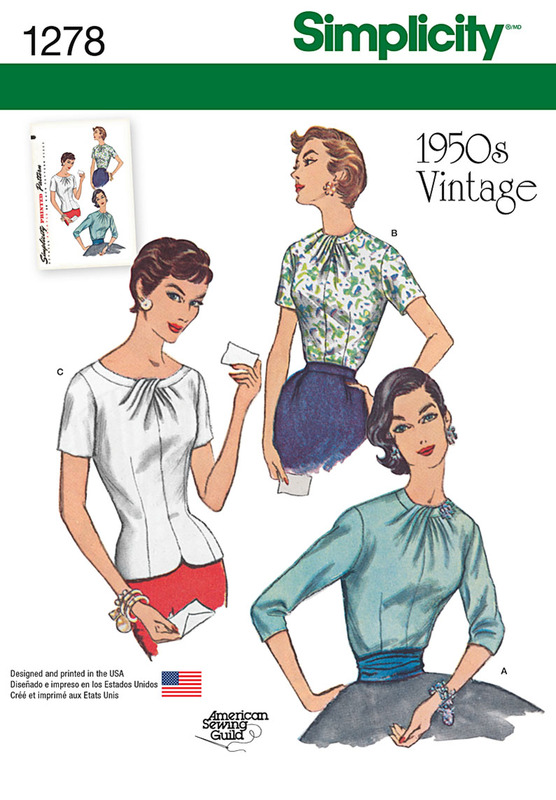 I think I’m going to attempt to make another blouse with the Simplicity 1278 pattern. I want to give it a fair chance before I decide I don’t want to be bothered by it.